Zip Password features fantastic search speed: up to 3,000,000,000 passwords per minute! Make no mistake, three billions passwords per minute (over 50,000,000 passwords per second). Note that speed depends on the archive type. Zip Password is able to handle archives containing only one encrypted file (some other tools fail on such archives). 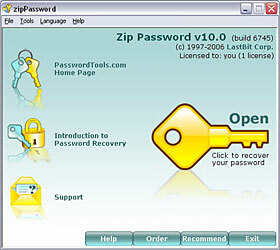 ZIP files created by various software packages in all compression modes are supported. The program is highly customizable: you can control and tune recovery process. You can interrupt the program at any time and resume the recovery process later. Known plain-text attack is available in Zip Password. For you, this means that if you have a plain unencrypted copy of any file from the archive, you can decrypt the entire archive within 24 hours regardless of the password length. Read how to use this method in Zip Password Documentation. is a utility to search for password protected documents on your computer. WinZip 9.x introduced the AES encryption. ZipPassword supports AES encrypted zip archives, however the search speed is very slow (due to the encyption scheme). It means that you can recover very short passwords only. We suggest that you use the dictionary attack with such archives. You can download additional dictionaries from here. 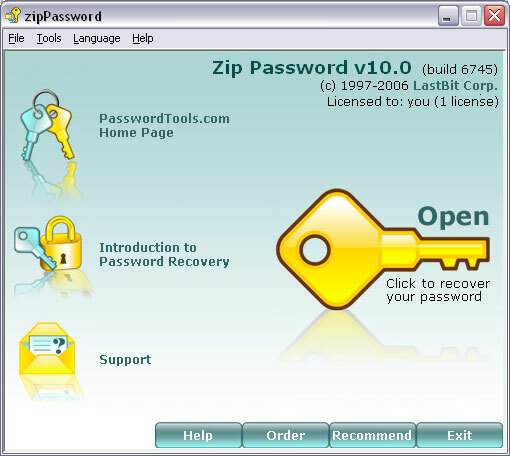 Although Zip Password is very fast, password recovery may take a lot of time. If a lost password is long, then the recovery time may be inappropriate (months, years, ...). This problem is of global nature - in general, protection in ZIP archives is very complex. You can use our Password Calculator to estimate required recovery time for your specific situation. Note that Zip Password achieves maximum speed on WinZip v8.0 (or earlier) archives that contain 3 or more files.